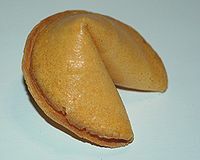 You may time to time want to make your own fortune cookies if you enjoy eating them from the Chinese restaurants. it's actually not that difficult. If you google "fortune cookie recipe", you will find plenty of resources and examples on how to make proper fortune cookies.